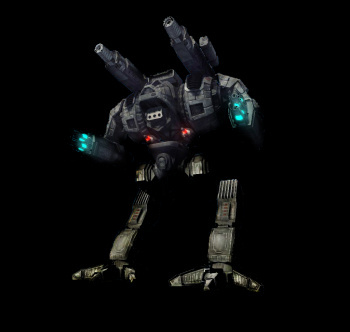 The Blood Asp is very agile, helping to negate the weak points of what is usually characteristic of assault mechs. The frame of the Blood Asp is slim, making it difficult to concentrate fire on one body part. Even if fire is concentrated, the Blood Asp mounts weapons in a large number of spots, making the loss of an appendage lessened. 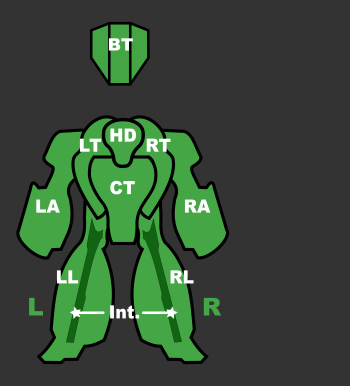 Back attacks, which are usually powerful against large mechs, are weakened thanks to full torso twist. The Asp also has a significant advantage while sniping from behind partial cover; its main weapons array is physically located high on the mech, allowing long range assaults while only exposing a small percentage of its body, greatly reducing effective counter-fire. The Blood Asp is not invulnerable, however. All variants are very high in price and the mech, though quite armored, does not sport the highest in its class. The majority of the money goes into the weaponry, making the electronics package on each variant minimal. In addition, the large variety of weaponry on each Blood Asp presents a high skill ceiling. The Blood Asp Prime is a menacing Clan Assault Mech with an arsenal of weapons that effectively cover both long and short range engagements. Two Clan Gauss Rifles can snipe enemies at 900m with a devastating 2460 Heavy Kinetic Damage. With EOptics and 2 Free Tons of ammo stores, the hurt will just keep coming. If roasting your opponents is your pleasure at the 400m mark, unleash an Alpha Strike with the 4 CHML for a blistering 2991 of Energy Damage, but be careful as this unit only contains 6 DHS. At 500m mark unleash the 2 CMPL at 415 Damage every 2 seconds. Finish off your prey at 350m with 1 CSRM4 or use it to dispatch those pesky little BAs. May the Gods of War help the fool who wanders into your sights. The 2nd variant of the Blood Asp highly equipped, EOptics, BHP, GECM, LAMS, 16 tons of Armor, Blood Asp A is a Pilot's Dream. Armed with, count them, 6xCUAC2s reaching out to touch someone at 1250m along with one ATM9 (ER), you will be knocking off their Armor long before you come into sight. Add a 2xCERLBLs, reaching out to 900m pounding out 3416.24 Damage just be mindful of the slow recharge times. Housing only 3 DHS the Blood Asp A is capable of generating heat very fast, a keen sense of your firing patten and coolant is important. The EOptics and BHP ensure you never loose sight of your target. Additionally, the ammo dependence gives this variant fantastic hammering power, so be mindful of your reload locations. GECM will allow you to move around mostly unseen while the LAMS will take care of incoming missiles. An all round medium to long range damage dealer, this relatively inexpensive Blood Asp variant will comfortably deal suppressing fire at both land and air assets. With a pair of LBX10s, a large twin array of clan large pulse lasers and an ATM9 launcher, combined with the 360 torso twist and high torso pitch, the B variant poses a high threat to anything in its sight. The large pulses can strip armor off of components with precision, the pair of LBX10 can exploit weakness in armor while being able to deal heavy hits to any air units in its effective range, providing you have a steady aim. Finally, the ATM9 can deal screen shake to opponents and have the speed and maneuverability to hit fast moving air units. Mechwarriors piloting this Asp should approach under the cover of GECM and terrain, often permitting alpha-strikes on unsuspecting prey. Once engaged, keep the range open, utilizing this Asp's superior mobility to your advantage while constantly chipping away at your opponents. Its outright damage output is lower than the other variants, so use caution when engaging other higher powered opponents. Mechwarriors, get ready to saddle up in the least expensive but brutally effective Blood Asp C and unleash some serious hurt at medium range engagements! While pounding your opponents with rapid fire from the twin UAC10s, fire the massive ATM12 launcher to fill the air with a stream of high speed, accurately tracking missiles. Your enemy's confidence will quickly falter as you continue your assault with twin Clan ER medium beam lasers and 4 Clan ER small beam lasers, dealing a massive amount of damage in a blink of an eye. Watch your heat though as the 6 DHS struggle with repeated alpha-strikes. Don't get overzealous and let the range drop below 120m as your heavy hitter ATM does no damage. Named "Vomit", boasting the highest price tag, this Blood Asp hits hardest at close to medium range. Once you bring your target within 700m, a devastating combination of 6 Clan ER medium beam lasers will make everyone reconsider the engagement. Adding two Heavy Large Lasers at 600m range into the mix, mechwarrior can form a deathray, precise and powerful, allowing you to accurately rip off limbs. Add some screenshake from its ATM6 (HE) to the mix to give it an additional edge in short range combat. Mechwarriors can keep a very high volume of fire going on this variant, because its 19 DHS have incredible cooling capacity. BUT BEWARE, not even its impresive array of heatsinks can't save you from overheating if you Alpha Strike. The E variant is similar to the prime but emphasizes a longer range weapon load out. Twin CGauss canons flail armor off enemies at long range while dual heavy large lasers punishes anyone that's foolish enough to get within 600 meters. 9 double heat sinks provide decent heat dissipation but cannot sustain constant alpha striking. Four machine guns harass targets at range and make quick work of Battle Armor. This Blasp is a serious threat to air and land assets, being able to bring all of its direct-fire weapons to bear via pin-point accuracy. Use your maneuverability to stay at medium to long ranges and you'll be a distinguishable opponent on the battle-field for a substantial time. An assault at 91kph? Check. Powerful energy weapon backup array? Check. Look no further, this one has it all in check. An brawler by the heart, sports two powerful LB-20-X auto cannons that deliver plenty of hurt and little of heat. The spare screen-shake is provided by the trusty cSRM4 launcher and while they reload, the laser array keeps the enemy in check at a sea of hurt. The main selling point is still to get its 17 tons of armor in and out at incredible 91kph - second to none. While doing so, keep an eye of the heat - you certainly don't want to burst into fire while opening the fight. The Blood Asp G should be known as a Meat Grinder with 1 CLRM5 putting out 15 shots/min of 871.7 damage locking on to your enemy at 1000m followed by 2xCERPPC with 2648 of Damage at 900m but aware of the slow recharge time giving only 7.5 Shots/min. Now the fun part 4xCUAC5 will produce 1386 Damage at 800m and if the pilot keeps his shots down to around 1.4 seconds/shot it can fire continuously, anything over that with cause it to overheat needing a 4 second cool down. The 4 DHS should maintain your heat but keep an eye on your gauge in a prolong fight. 4 Free Tons are best used for the Ultra AutoCannons and the EOptics maintain sight of your enemy. The Blood Asp is a Clan Assault Mech released in 0.5.4. Featuring a 64.8 km/h top speed, unlimited torso twist range, and more armor than the Madcat MKII, the Blood Asp is a uniquely agile and powerful Assault Mech - the pinnacle of Clan Mech technology and priced accordingly. Created by Clan Star Adder as an insult to their enemies, Clan Blood Spirit, the Blood Asp has a large amount of available pod space for its size. Based on the Kingfisher, the Blood Asp adds an XL Engine, but space constraints forced the replacement of the Kingfisher's Ferro-Fibrous armor with standard plate. The Blood Asp incorporates sixteen tons of this armor and numerous double heat sinks in the base chassis. One of the first 'Mechs to field the breakthrough Heavy Laser technology, the Blood Asp proves to be an offensive powerhouse. Delivering incredible damage at all ranges, the Blood Asp makes short work of any enemy regardless of size. This page was last edited on 29 January 2019, at 19:43.